Kate (aka Pixels) has a background in Multimedia and Illustration. She’s focused on perfecting the Fallout 3 utility jumpsuit and has been studying pattern drafting online to help make her designs come to life. Following our post on the Women’s Vault 101 Jumpsuit Pattern, we have compiled some garment research for the Men’s Fallout 3 Vault 101 Jumpsuit pattern. We begin with the same materials list, after that, everything (aside from the zip and collar) is different. Life as a Vault Tec tailor wasn’t meant to be easy. Cotton Denim with some stretch, this makes it a bit easier to work with. A mid to heavy weight denim so the cuffs will look like authentic 50’s work wear. A mid to dark shade of indigo. A good dark indigo base will fade out and look like the Fallout 3 vault suits. 1950’s style jeans with a straight leg, turned up cuff and faded indigo. Fallout’s universe is set in a futuristic post-apocalyptic 1950’s. In the images below you can see how the vault suit was heavily influenced by the science fiction movie, Forbidden Planet, with vintage denim work clothes mixed in. The vault 101 jumpsuits are casual with lots of seams and padding. The best way to approach the deconstruction of the Vault Suit design is to think of a 1950’s style denim jumpsuit that was designed for a sci-fi movie. This helps to explain the complicated seam lines and vintage fit. You can see more of this in the Fallout 3 concept art by Adam Adamowicz. Kneepads, exposed zips and rolled cuffs give the suit a utilitarian flavour, with the seam lines, shoulder tube, and pip-boy 3000 lending a retro futuristic twist to the completed design. With any costume project, I like to begin with real world research. I found a fantastic men’s denim suit on Pinterest. The drape and fit of the fabric is perfect. With a few alterations to the collar, and seams, it would make a brilliant vault suit. You can see the fit is also era appropriate with a high hip and longer front fly. It looks like the knee pads were sewn in separately…is that the case? I’m making my own vault suit and wondered how to go about constructing the knee pads. Oh wait. I just re-read the section about the knee pads. Oops. Yep, I made the pads separately with some padding under seperate denim pieces. It was much easier than the method I used for the Women’s suit I made, which used neoprene under the leg piece with stitching over the top. It looks much neater to attach it later. If you have any further questions, you can find us on Facebook http://www.facebook.com/AtomicLadiesCosplay. Good luck with your vault suit! Alright, I’ll try my hand at it! Thank you! I highly recommend the two piece design, it’s so much better for bathroom breaks. Especially if you have a pip-boy to deal with. 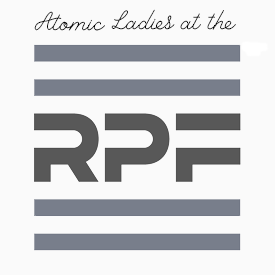 © 2019 Atomic Ladies | Video game costuming, crafting projects and tutorials. Our main love is Fallout cosplay with some cyberpunk and Nintendo fandom thrown in for good measure.